C1644. 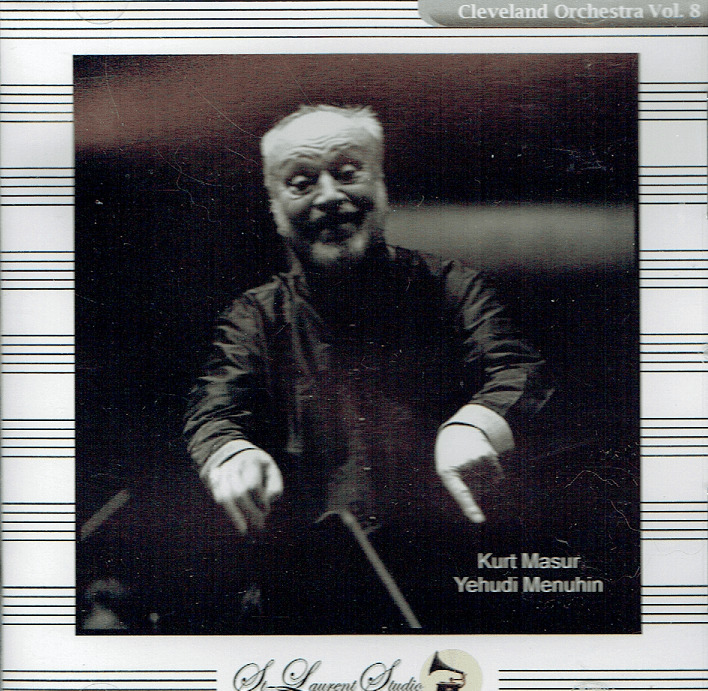 KURT MASUR Cond. 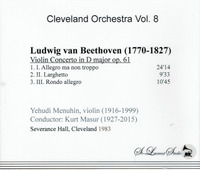 Cleveland Orch., w. YEHUDI MENUHIN: Violin Concerto in D (Beethoven). (Canada) St Laurent Studio YSL T-512, Live Performance, 1983, Severance Hall. Transfers by Yves St Laurent. "Kurt Masur, the music director emeritus of the New York Philharmonic, who was credited with transforming the orchestra from a sullen, lackluster ensemble into one of luminous renown, was the Philharmonic’s music director from 1991 to 2002. When he took its helm, the orchestra was roundly considered to be a world-class ensemble in name only, its playing grown slipshod, its players fractious and discontented, its recording contracts unrenewed. The selection of Mr. Masur to lead the Philharmonic astounded nearly everyone in classical music circles. A specialist in the music of Central European composers — notably Beethoven, Brahms, Mendelssohn, Mahler and Bruckner — he had built a respectable if not scintillating career amid the musical and political repressions of East Germany. He could bring a meticulous if somewhat dictatorial approach to rehearsal discipline, something that New York’s unruly orchestra was widely thought to need. Mr. Masur made his formal debut as the Philharmonic’s music director — in a program featuring Bruckner, John Adams and Aaron Copland — on Sept. 11, 1991. But he had impressed the critics even before his tenure began. Over the 11-year marriage that followed, Mr. Masur would bring to the Philharmonic a restored musical vigor; new recording contracts and regular radio exposure; a populist approach that helped expand its graying, rarefied audience; and a determination to improve the dubious acoustics of Avery Fisher Hall, its longtime home. He also brought to the podium the ardent conviction that music-making was a moral act that could heal the world. It was a belief he had put into spectacular public practice in 1989, when Communism in East Germany began to crumble and he used his singular renown there to avert bloodshed. Mr. Masur would put it into practice again, memorably and movingly, in a New York ravaged by the attacks of Sept. 11, 2001. The music directorship of any major orchestra entails a delicate counterpoint of democracy and despotism. At first, many players viewed Mr. Masur’s relentless work ethic — and his musical criticisms unsoftened by politesse — as a form of tyranny. What was widely agreed was that the Philharmonic’s sound changed for the better almost instantly. After the mud of the Mehta era, the Masur sound was like a mountain stream. The difference was startling. One could go hear the Philharmonic play a Schumann or Brahms symphony without wincing. One could even anticipate a ‘St. Matthew Passion’ or Beethoven Ninth, not only with complete assurance but a real sense of occasion. Mr. Masur’s imperious behavior was occasionally directed toward audiences. In a widely reported incident from the winter of 1998, he walked off the Avery Fisher podium in the middle of a performance of Shostakovich’s Fifth Symphony, vexed by concertgoers’ coughing. But what THE TIMES called ‘his finest hour, and a gift to the city’, came on Sept. 20, 2001. That night, in a nationally televised memorial to the victims of the Sept. 11 attacks, Mr. Masur led the Philharmonic in a performance of Brahms’s German Requiem’. “Yehudi Menuhin, Baron Menuhin, OM, KBE was an American-born violinist, violist, and conductor who spent most of his performing career in the United Kingdom. 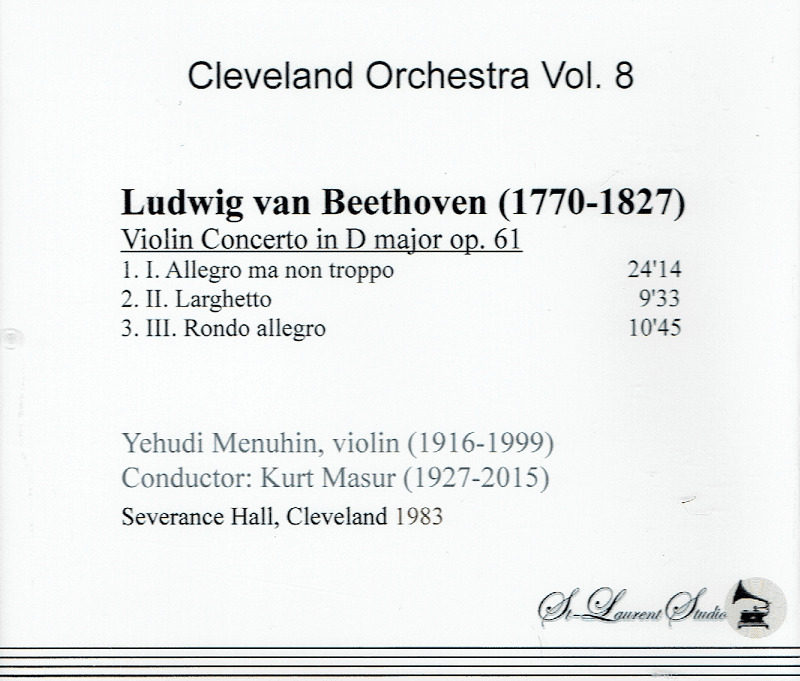 He was a student of Louis Persinger, Georges Enescu, and Adolf Busch. Yehudi Menuhin performed for allied soldiers during World War II, and went with the composer Benjamin Britten to perform for the inmates of Bergen-Belsen concentration camp, after its liberation in April 1945. He went back to Germany in 1947 to perform music under the conductor Wilhelm Furtwängler as an act of reconciliation, becoming the first Jewish musician to go back to Germany after the Holocaust. After building early success on richly romantic and tonally opulent performances, he experienced considerable physical and artistic difficulties caused by overwork during World War II and unfocused early training. Careful practice and study combined with meditation and yoga helped him overcome many of these problems, and he continued to perform to an advanced age, becoming known for profound interpretations of an austere quality. In 1952, Menuhin met and befriended the influential yogi B.K.S. Iyengar. Menuhin arranged for Iyengar to teach abroad in London, Switzerland, Paris and elsewhere. This was the first time that many Westerners had been exposed to yoga. In 1962 he established the Yehudi Menuhin School in Surrey. He also established the music program at the Nueva School in Hillsborough, California sometime around then. In 1965 he received an honorary knighthood. During the 1980s he made jazz recordings with Stephane Grappelli and of Eastern music with the great sitarist Ravi Shankar. In 1985 he was awarded British citizenship and had his honorary knighthood upgraded to a full one. In 1993 he was created a life peer as Baron Menuhin, of Stoke D'Abernon in the County of Surrey. Lord Menuhin died in Berlin following a brief illness, from complications of bronchitis. Menuhin credited the German-Jewish philosopher Constantin Brunner with providing him with ‘a theoretical framework within which I could fit the events and experiences of life’ (CONVERSATIONS WITH MENUHIN, pp.32-34).